It’s been 45 years since an outbreak of dangerous storms produced nearly 150 tornadoes across the U.S. and Canada over a 24 hour period. Reports say during one short period more than a dozen tornadoes were on the ground simultaneously. The storms claimed the lives of hundreds of people and injured thousands more. It was a day in 1974 that Xenia residents never forgot. This audio from Xenia-tornado.com gives just a small taste of what Xenia residents heard on April 3, 1974, the day that saw more than 1,400 homes and buildings damaged, or completely destroyed. The massive F5 tornado touched down in Xenia at 4:30 p.m. on a Friday afternoon, destroying nearly everything in its 32-mile path. The twister destroyed roughly half of the city of Xenia, hitting nine churches, and most of the city’s schools, though classes had been dismissed an hour earlier. More than three dozen people lost their lives that day. Speaking in a 2013 interview, Greene County Public Library Director Karl Colon says the event was transformative for the city of Xenia. "You had to rethink the whole idea of what the town was and what the town was to become, in order to even be able to get back on your feet," Colon said. "It took a lot of vision; it took a lot of commitment from the community. They never gave up on their belief in their hometown and they brought it back to life." 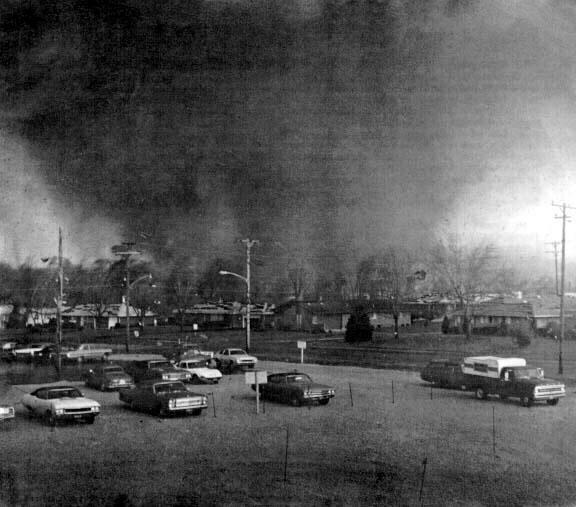 In 2014, Greene County libraries invterviewed Xenia residents about their memories of the 1974 tornado. You can find those here. This week on WYSO Curious –we answer two listener questions about tornados. First question: Why is the Miami Valley a tornado hotspot? And secondly: How does the National Weather Service go about alerting us when a tornado is approaching?